Sleaford Town bowlers enjoyed another good week with five wins in six matches. Parker, Andrew Morris, Roger Neaverson, Trevor Cope lost 25-20. * Hosting Billinghay in the ASC Metals League one rink was again enough to take the aggregate score 66-53 and another six points. Scores: Robin Wilson, Ken Irwin, Bas Gilbert won 33-12; Joan Gilbert, Linda Morris, Gwen Campbell lost 18-23, Peter Annison, Andrew Morris, Roy Markham lost 15-18. * At Eagle in the City League, a very close game saw Town win two rinks and take the aggregate by two shots, 57-55, for eight points. Scores: John Parker, Neil Mapletoft, Trevor Cope won 20-17; Martin Titley, Richard Barnes, Paul Jobson won 19-18; Kris Moore, Roger Neaverson, Andrew Bird lost 18-20. * At home to Collingham in the Jubilee Trophy, Town win three rinks and the aggregate 93-54. Calum Campbell lost in the singles 14-24, but Robin Wilson and Bas Gilbert won the doubles 24-12, Neil Mapletoft, Kris Moore and Trevor Cope took the triples 26-8, and the fours set of Ruth Bird, Julie Cope, Roger Neaverson and Ken Irwin won 29-10. * Hosting Ruskington in the Woodhall Spa Friendly League, all three rinks won to take maximum six points. Scores: Clive Steadman, Steve Morris, Bas Gilbert won 20-17; Robin Wilson, Brian Srawley, Ken Irwin won 29-11; Joan Gilbert, Kris Moore, Nick Faulkner won 21-15. 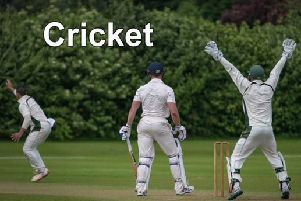 * Town’s only defeat came at Leadenham in the Sleaford League where the rink wins were shared but Leasingham edged the aggregate 71—70. Town took eight points. Scores: Clive Steadman, Bas Gilbert, Ken Irwin won 21-13; Peter Stoke, Julie Cope, Andrew Bird won 24-18; Joan Gilbert, Gillian Annison, Gwen Campbell lost 11-20; Mick Jarrald, Brian Srawley, Mick Faulkner lost 15-20.